Exporter of a wide range of products which include bell crank lever, jointed roof truss on wheels, simple wheel axle, parallelogram law of forces apparatus, polygonlaw of forces apparatus and jib crane apparatus. To confirm leverage ratio effect; and take moments about a pivot. A range of 5 ratios from 1 to 5 to measure the load and effort. Weight hanger and weights supplied. 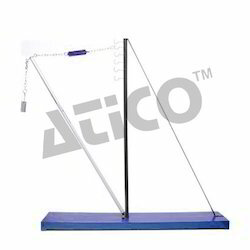 The apparatus is about 1.2 meter in length and strongly Constructed in all metal, one leg is fitted on a immoveable bracket and the other on rollers. Spring balances show tension on the rod and the compression on rafters. complete with specially made dynamometer, cahin and pan, but without weights. Consisting of a wooden double wheel with flat bottomed grooves, 150 and 50 mm. diameter respectively. The wheel is pivoted on a spindle 10 mm. diameter which projects for a distance of 100 mm. so that the apparatus may be clamped to a normal retort stand. The apparatus is supplied complete with two hooks and 6 meters of whipcord, but without masses and stand. 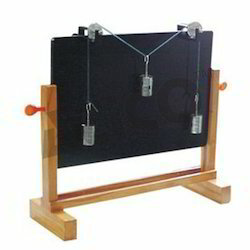 This item is similar to the wall type but is intended for use in laboratories where wall space is limited. At thick plywood piece of thickness 12 mm having substantial metal stand with 2 set of z-pulley and 3 set of ( 50 x 5 gm) slotted weights. Polygon of Forces :- It consists of a wooden board of size 75 x 70 cms, Provided with Two wall brackets and four adjustable frictionless aluminium Z Pulleys complete with four one Kg. wets and one scale pan. Advanced Technocracy Inc. is Manufacturer, Exporter & Supplier of Jib Crane. This unit is designed to study forces in jib crane elements. Jib crane has two elements which are attached to a vertical rod. The lower element is called jib and the upper element is termed as tie. Load is applied at the junction of jib and tie to produce tension and compression in tie and jib respectively. 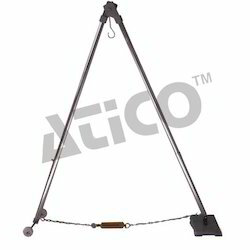 The unit consists of a metallic rod which provides the support locations for jib and tie. Load is applied via a hanger on the junction of jib and tie. 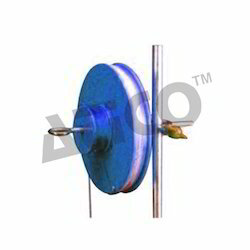 To measure the deformation in jib and tie, dial gauges are connected to both elements. Advanced Technocracy Inc. is Manufacturer, Exporter & Supplier of Simply Supported Beam. Consisting of two knife edge end supports, a hanger with knife edge, and a pointer moving Over a graduated scale. Complete with scale pan and two beams, one of iron and the other of wood each beam is 120 cm in length. Without weights. 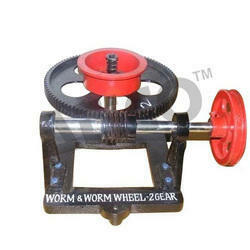 An all metallic self contained apparatus useful for demonstrating the efficiency for worm and wheel and also the principle of work. Consisting of a machinecut worm gear of 25 cm diameter, carrying a meta l drum of 12 cm diameter, and machine cut worm on steel spindle carrying a 12 cm diameter pulley. The whole arrangement is fixed on heavy cast iron bracket capable to be fixed to wall. Complete With effort pulley, string and hooks but without weights. 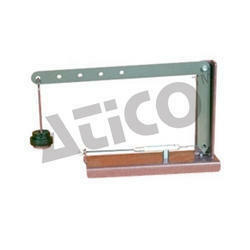 The set comprises of a cylinder capper, a cylinder carried and a ladle. The cylinder capper consists of a base on which two accurately machined plates are mounted vertically. One plate is firmly fixed and the other one is adjustable horizontally. Two plates are provided with holders for holding the cylinder in position. 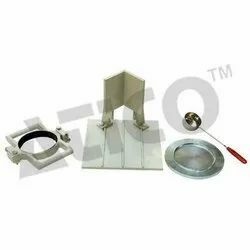 The holders are split and the bottom half of each holder is fixed firmly and the top half of each is removable and bolted down to the lower half. One the upper parts of the vertical plates V"s are provided for pouring the capping compound.Two spacers are also provided. Complete with cylinder carrier and ladle for molten compound. 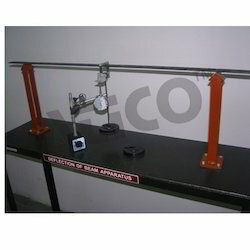 Looking for Applied Mechanics Lab Equipments ?